Base set: The set consists of 90 basic cards, 15 Superstars, and 30 Future Watch Prospects. The base cards feature a giant white border encompassing the action shot, with a different color scheme for each team. I was able to complete the basic set 1-90 with 17 duplicates on the side. 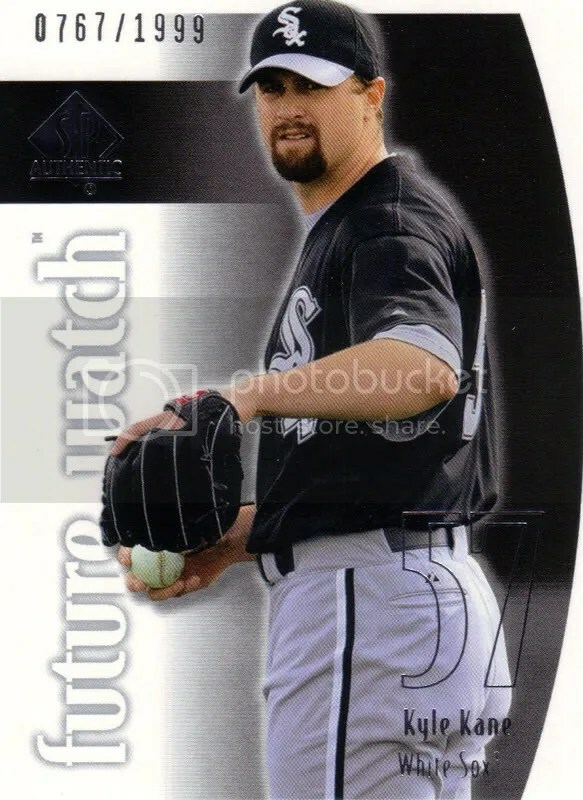 I pulled one Future Watch card numbered to 2500 of Ramon Ortiz. The Superstars subset is also limited to 2500, but I did not receive any in this box. United Nations (1:4 packs): This is the most common insert this product has to offer. There are only 10 cards seeded 1 in 4 packs so this set should be rather easy to complete. They are horizontal and feature the flag of each player’s country of origin in the background. My players were: Ivan Rodriguez, Sammy Sosa, Vinny Castilla, Andres Galarraga, Kazuhiro Sasaki, and Ken Griffey, Jr (USA! USA!). Midsummer Classic (1:12 packs): As one would expect, this insert pays tribute to Major League Baseball’s All-Star Game. In 2000, it was held in Atlanta. 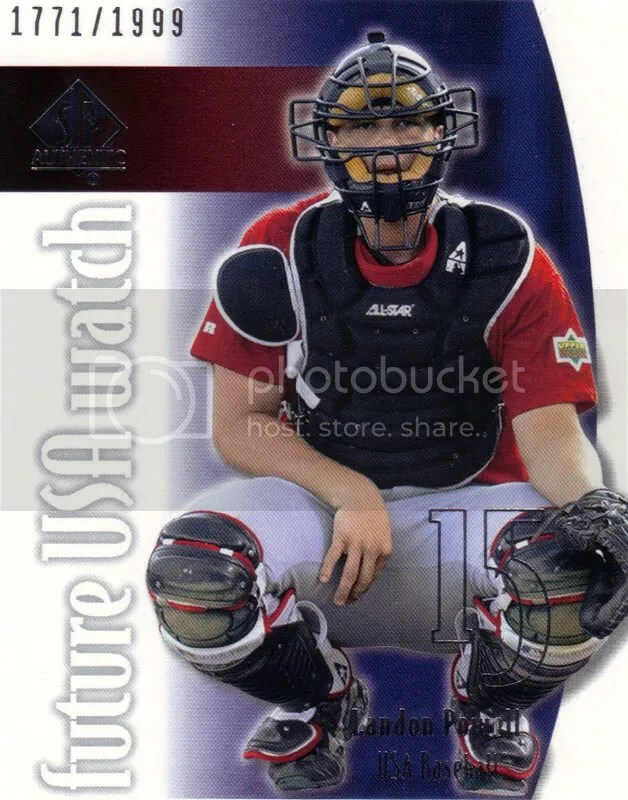 The back of the card featured the career ASG statistics of the player depicted on the front. I pulled cards of Jose Canseco and Tony Gwynn. 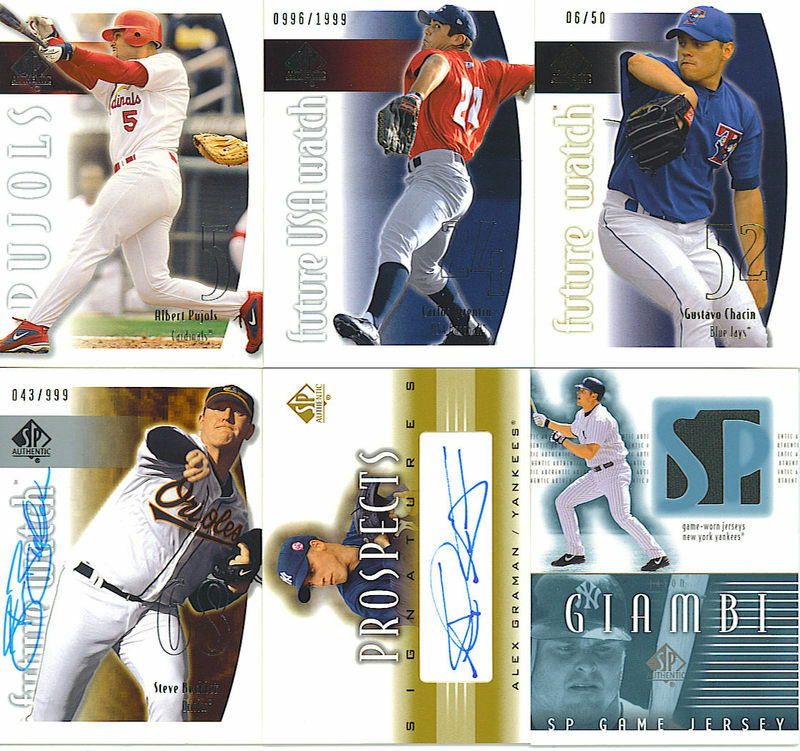 Premier Performers (1:12 packs): This is a typical SP Authentic insert, at least for the 2000 version. The card has a refractor-like finish with a faint image of the player in the background. The cards look nice, but perhaps this feature was a little overused as the Cornerstones and Supremacy inserts also follow this pattern. I pulled Sammy Sosa and Ivan Rodriguez. Cornerstones (1:23 packs): Like the other inserts mentioned, these look great. The card features the player’s image inside a diamond on the center of the card, with the player’s image inside a colored column (color scheme based on team – i.e. a Red Sox card would be red) right behind it. My card was of Nomar Garciaparra. Chirography (1:23 packs): And now the reason you probably clicked on this thread, the autographs. Chirography was the premier insert set of SP Authentic long before it was made into a high-end football product. These fall 1 per box and come with a gold parallel, which was limited to the player’s jersey number. While busting this box, I noticed this insert in the 3rd or 4th pack I opened. I slid the card to see the name “Guerrero” and the word “Expos.” Could it be? Yes, it was none other than……………WILTON Guerrero!! Son of a #$%@! I forgot he existed until I saw this card, actually. For those wondering, his career line: .282, 11/127 with 42 steals in 8 seasons. The card design itself looks alright, with both an action and portrait shot of him. The actual autograph looks like crap, looks like he drew a sideways, bent golf club on the card. For the record, younger brother Vladimir is also in the set. Buyback (1:95 packs): In every 4th box on average, a signed buyback card can be found. 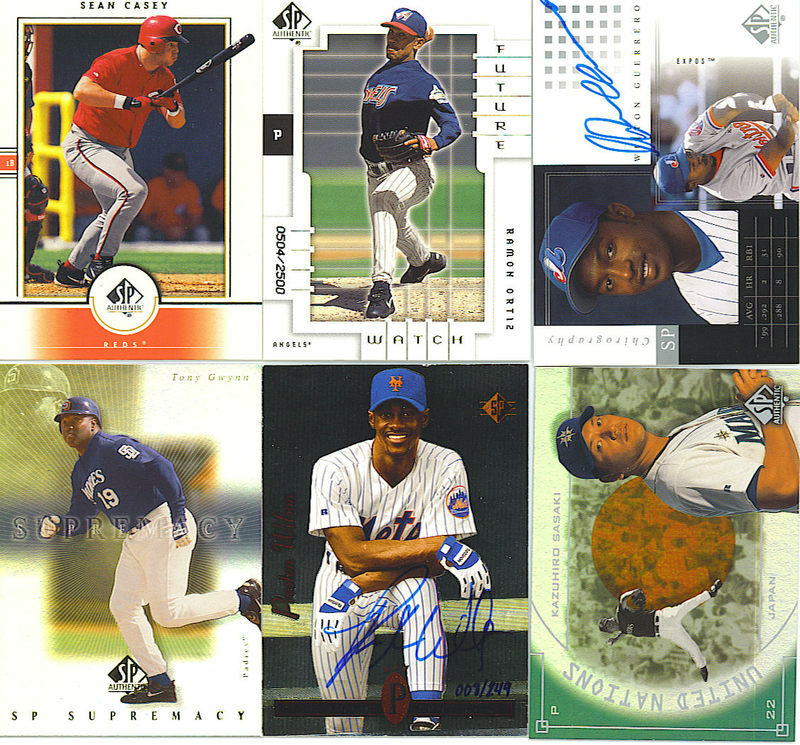 The cards used in this set are SP cards from 1993-99 and vary in print run. Anywhere from 1-539 of each card can be found. If you’re lucky enough to pull one of these, you’ll find the card already in a soft sleeve in the pack, with a separate authentication card as well. I was able to find a 1994 SP foil autographed card of Preston Wilson, who was then with the Mets. It is hand numbered 008/249. Not the greatest, but it was nice to pull something other than that Guerrero. Final Thoughts: This certainly wasn’t the best box I’ve opened and it didn’t come cheap, but it was still fun. A complete short set can be had in a single box, along with a ton of attractive inserts. Altogether, 15 of my 24 packs had some sort of insert, subset, or autograph. The Chirography cards are found 1 per box and contain some very elusive autographs, including Barry Bonds and Sandy Koufax! The buyback cards contain a VERY impressive checklist and some are extremely shortprinted so a single pull could make your box and then some! One warning though, some of the buyback autographs were available only through an exchange card, which obviously expired long ago (stupid UD redemptions!). Lastly, there is the chance of pulling a Joe DiMaggio game-used jersey card. There are 500 jersey cards plus a gold parallel limited to 56. Like I said before, this box isn’t exactly the easiest to find, and may not come cheap, but it certainly makes for an enjoyable break (with some INCREDIBLE potential). I definitely think it’s worth a shot so if you decide to break one, make sure you pull a better autograph(s) than me! As always, I appreciate the read and good luck with your boxes!